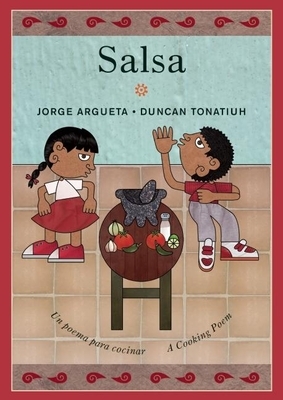 In this new cooking poem, Jorge Argueta brings us a fun and easy recipe for a yummy salsa. A young boy and his sister gather the ingredients and grind them up in a molcajete, just like their ancestors used to do, singing and dancing all the while. The children imagine that their ingredients are different parts of an orchestra -- the tomatoes are bongos and kettledrums, the onion, a maraca, the cloves of garlic, trumpets and the cilantro, the conductor. They chop and then grind these ingredients in the molcajete, along with red chili peppers for the "hotness" that is so delicious, finally adding a squeeze of lime and a sprinkle of salt. When they are finished, their mother warms tortillas and their father lays out plates, as the whole family, including the cat and dog, dance salsa in mouth-watering anticipation. Winner of the International Latino Book Award for Guacamole, Jorge Argueta's text is complemented by the rich, earthy illustrations of Duncan Tonatiuh, winner of the Pura Belpre Award. His interest in honoring the art of the past in contemporary contexts is evident in these wonderful illustrations, which evoke the pre-Columbian Mixtec codex. Jorge Argueta is an award-winning author of picture books and poetry for young children. He has won the International Latino Book Award, the Americas Book Award, the NAPPA Gold Award and the Independent Publisher Book Award for Multicultural Fiction for Juveniles. His books have also been named to the Americas Award Commended List, the USBBY Outstanding International Books Honor List, Kirkus Reviews Best Children's Books and the Cooperative Children's Book Center Choices. A native Salvadoran and Pipil Nahua Indian, he spent much of his life in rural El Salvador. He now lives in San Francisco, California. Duncan Tonatiuh is an author and illustrator of several highly acclaimed books for young readers, including Dear Primo: A Letter to My Cousin, Diego Rivera: His World and Ours and Pancho Rabbit and the Coyote: A Migrant's Tale. His most recent book is Separate Is Never Equal: Sylvia Mendez and Her Family's Fight for Desegregation. He has won the Pura Belpre Illustration Award (and three honorable mentions), the Tomas Rivera Mexican American Children's Book Award (twice), and his books are among the Americas Award Commended Titles and Notable Books for a Global Society. He lives in San Miguel Allende, Mexico. Elisa Amado lives in Toronto.